I have something quite different to share today. The remarkable coiled paper art of Jae Ko's Force of Nature - Shiro is created on a "humongous" scale, as she says in this video that I'm positive you'll enjoy. The Korean-born artist has been on my radar ever since Lisa Nilsson (whose Tapis Series, Angelico and Tissue Series you might remember) told me how much she admired her work after seeing it in a Washington D.C. gallery a few years ago. 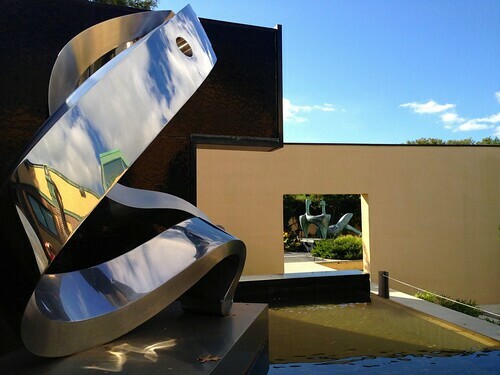 When I learned that Jae was installing a year-long exhibit at Grounds for Sculpture, titled Selections, in Hamilton Township, New Jersey, I was determined to visit... this past Friday turned out to be the day. Sunny skies after a deluge the evening before meant that the entire park was gleaming. It was the perfect time to experience the many (and I mean many!) sculptures that dot the expansive property, which was created on former state fair grounds by sculptor Seward Johnson. 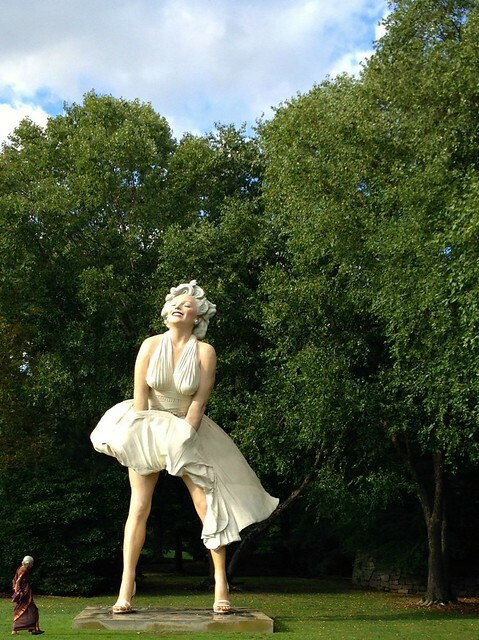 Marilyn Monroe, as seen in 26 feet of glory, is one of his works. Jae Ko's dimensional paper sculptures are displayed inside two buildings and are just as remarkable as Lisa said. Force of Nature - Shiro, is Jae's largest project to date. Spanning a fan-shaped wall, the 80 foot sculpture is composed of 20,000 pounds of recycled kraft paper in three shades of white. Inspired by the nature she experienced at Glacier National Park, Shiro represents an icy slice shaped by terrain and wind. Jae and a ten-person team unrolled and re-rolled paper coils to loosen them, and would then swirl the rolls with a stirring motion on the floor to create space between the coils before attaching them to the wall one by one with 1200 unseen brackets. This was a 30 day, physically demanding process. On the opposite side of the huge space is a companion sculpture that represents a remnant of glacial melting as it spills onto the shiny floor, serving as a metaphorical puddle. More of Jae Ko's dimensional forms were on display in a second building. 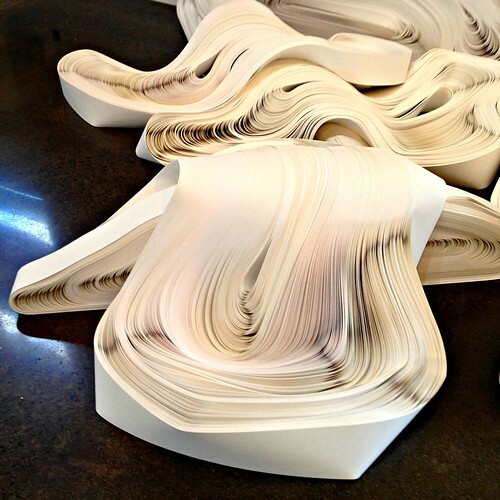 These were created from adding machine tape that Jae had rolled and twisted into undulating shapes, and then soaked in a water and Japanese calligraphy ink bath. It was difficult lighting in which to take good photos, but I can tell you that the wall sculptures have a remarkably soft appearance that reminded me of suede. A solid black Sumi ink sculpture looked just like velvet. Selections is on exhibit through February 7, 2016. 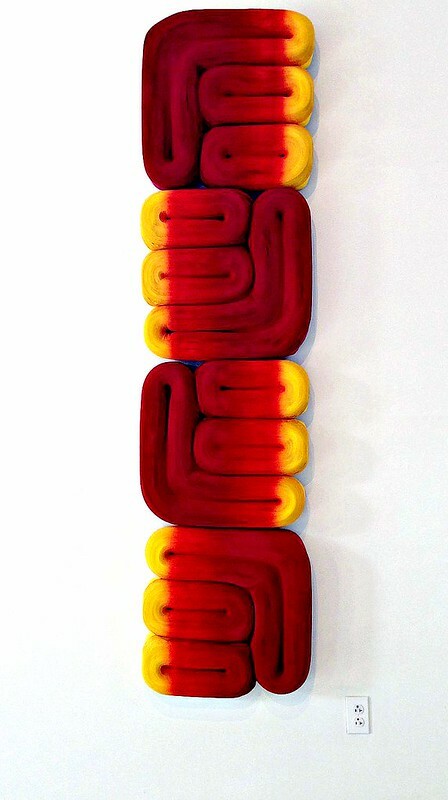 See many more examples of Jae Ko's sculptures at artnet. Look for an upcoming post about a second and equally enjoyable paper art exhibit that was also on display at Grounds for Sculpture. I'm glad you enjoyed the post, Heather. I know you would enjoy the exhibit. I'm glad you enjoyed seeing it. The video of the making is truly inspiring. The technique she uses to create spaces between coils is so clever. Her tables serve as big tools for rolling paper. Must have been stunning in person. So glad you enjoyed the post, Suganthi, and yes, truly stunning. I loved watching her swirl the coils in the video... that was my favorite part! Incredible! Going on the travel list.